A few weeks back we launched our Meeting Planner. Overall we were pretty pleased with how it came out but we knew there was some room for improvement. With feedback in hand we sat down, separated the wheat from the chaff and decided to implement a couple of core improvements. 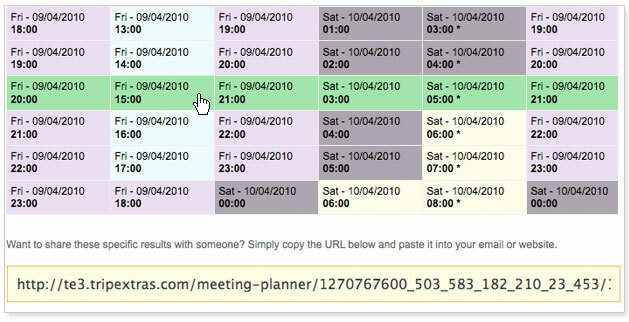 Primarily we worked on a way to more easily highlight and share a specific time span. Let's say you need to arrange a meeting across a few locations. You use our Meeting Planner and pick what you believe to be the best option. You can now lock that selection in place by clicking on it which in turn generates a link found at the bottom of the results table. Copy and paste that link into an email and send it to your colleagues who in turn can update that selection to different time spans that suits them better and email that back to you. All in all it just makes finding that ideal time to meet much much easier. Give it a try.